Highland Park Village is a one-stop shop for the very best in gourmet foods, with Molto Formaggio offering up decadent cheeses and Royal Blue Grocery displaying the finest of wines to pair them with. We have partnered with each to bring you their must-have wine and cheese pairings, perfect for any party, gathering or a night in. For goat’s milk cheeses such as La Tur, white wine is the way to go as to not override a goat cheese’s generally mild flavor. Opt for either a 2016 RYME Vermentino “Hers” from Las Brisas Vineyard in Carneros, California or a 2013 Hanzell Chardonnay, hailing from Sonoma Valley, California. The 2016 RYME Vermentino “Hers” can be spotted by its characteristic green label, alluding to its fresh yet energetic taste. This aromatic wine hails from the cool, foggy Las Brisas Vineyard with its grape plants situated on a sandy silt and gravel bed, aiding in its signature taste. 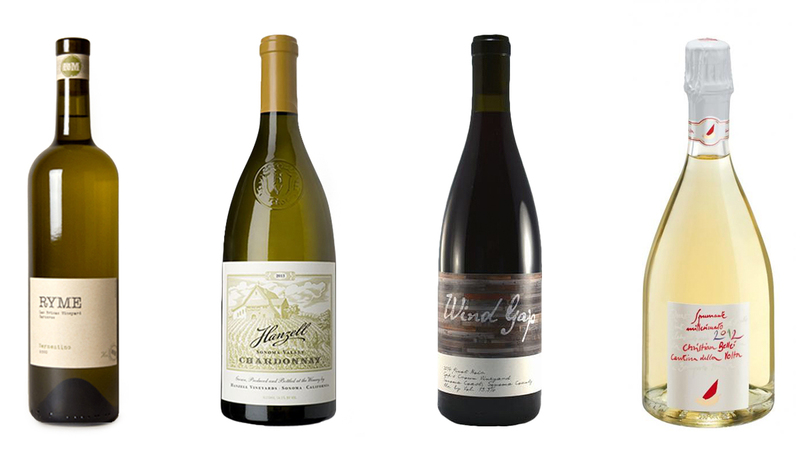 The Hanzell Chardonnay, on the other hand, offers hints of pear, green mango, lemon zest and jasmine, accompanied by aromas of brioche, anise and dusty slate, creating its invigorating yet savory taste. Both wines offer the perfect match for goat cheeses and other light cheeses, bringing out the cheese’s subtle and even grassy notes with every sip due to their fruity, crisp tastes. Enjoy a vast array of wine selections from Royal Blue Grocery. From left to right: 2016 RYME Vermentino “Hers,” 2013 Hanzell Chardonnay, 2014 Wind Gap Pinot Noir, 2012 Cantina della Colta Blanco Lambrusco. 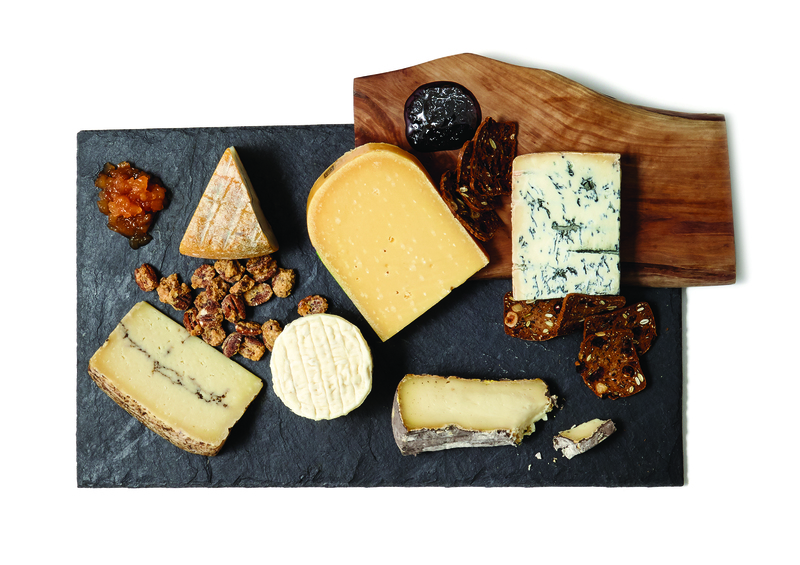 For bolder cheeses such as Wild Weide and other aged Gouda, red wines make a perfect pick. Royal Blue Grocery’s top two contenders are the 2014 Bruno Rocca “Trifolé,” Dolcetto d’Alba from Piedmont, Italy and a 2014 Wind Gap Pinot Noir reigning from the Sonoma Coast. The Bruno Rocca “Trifolé” is produced with Dolcetto grapes, adding to its intense ruby color. Emoting floral and fruity scents, this wine also produces notes of violet, ripe cherries, and plums, offering a warm and soft texture that envelopes one’s mouth. Pair with soups, boiled mix and medium seasoning cheeses to highlight its almond finish. With delicate aromas of pomegranate and strawberry, the Wind Gap Pinot Noir’s taste connotes that of earthy tones and aromas reminiscent of mushroom, honey, and spice. Pair either of these choices with an array of salty, buttery cheeses like triple-cream cheeses or mild aged cheddars for a flawless combination. Can’t decide between a red or a white? Royal Blue Grocery’s wine specialists applaud a prestigious sparkling wine. Opt for the 2012 Cantina della Volta Blanco Lambrusco or the NC Pierre Péters Blanc de Blancs “Cuvée de Réserve” Champagne to pair with blue cheeses like a Gorganzola Piccante. Sweet wines such as these bring out strong flavors of blue cheeses and gorgonzola. The 2012 Cantina della Volta Blanco Lambrusco reveals pleasant floral scents combined with notes of green and yellow apple, pear and lemon, offering a dynamic, round and velvety finish. On the other hand, the “Cuvée de Réserve” Champagne not only offers up a beautifully strong ribbon of signature bubbles, but is both fresh and smooth. Note- this champagne’s at first flowery and fruity taste blossoms into a citrus and mineral finish in its finale, making it the perfect complement to the excitement that a blue cheese brings to the pallet. To find these wines and more visit Royal Blue Grocery Sunday-Saturday from 7:00AM-10:00PM at 1 Highland Park Village, and for a vast selection of cheeses and more visit Molto Formaggio Monday-Saturday from 10:00AM-6:00PM and Sunday from noon-5:00PM at 68 Highland Park Village.